Despite what we were taught as kids, it seems those big golden birds we serve up at Thanksgiving might not actually be turkeys—at least if you're from Japan. If this $28 Hello Kitty plush toy is assumed to be biologically accurate—and I see no reason why it shouldn't be—turkey dinners actually come from cute cultural icons turned inside-out. It doesn't get much more horrifying than that. And if Thanksgiving is your favorite time of the year, you might want to skip the video of this toy transforming. 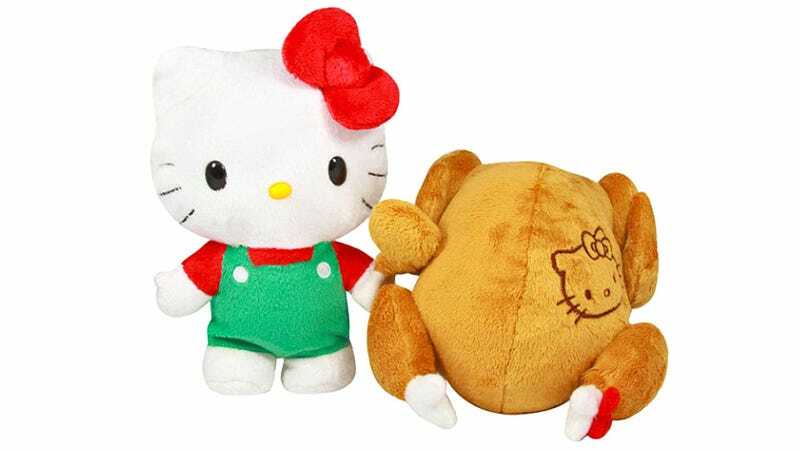 Seeing a turkey emerge from the back of Hello Kitty's skull is an upsetting image you won't soon be able to forget. There's a hamburger version too that's actually slightly more adorable since it manages to retain some of the Hello Kitty imagery when transformed. But relatively speaking it's still pretty damn disturbing.